Welcome to Down On The Street, where we admire old vehicles found parked on the streets of the Island That Rust Forgot: Alameda, California. Hooray for old Detroit station wagons! You don't see many small Detroit wagons these days, since the Vista Cruisers and Country Squires sold in such greater numbers back in the pre-SUV era, so I was very happy to spot this bright yellow, Moon disc-equipped Chevy II (or maybe it's a Nova- hard to say with the emblems removed) parked downtown. 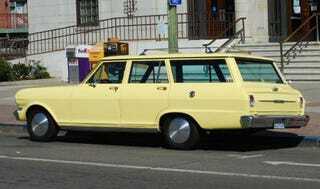 You could get your little Chevy wagon with a 153-cubic-inch four-cylinder- whoa, a four-cylinder in a 60s Detroit wagon? Call the HUAC! You could also get a 194-cube six-cylinder; sorry, V8 fans, you had to wait until '64 for an optional 283 in your Chevy II. Even though this wagon's owner is clearly a salt-flat-crazed hot rod hoodlum, the single exhaust suggests that he or she has kept the four or six under the hood. Parts runnner? Daily driver?